This correspondence between Governor Schoeppel and Minister C. Fosberg Hughes of the Plymouth Congregational Church in Lawrence, Kansas, concerns the possibility of using Japanese Americans as laborers in Kansas. In his correspondence with Governor Schoeppel, Hughes argues that many people have misinterpreted Schoeppel's position toward Japanese Americans in Kansas. In fact, Hughes contends that Schoeppel's statement "has been used unfairly by the American Legion crowd in town to whip up public sentiment against the resettlement of these families." In his reply to Hughes, Governor Schoeppel clarifies his position and states that, as Governor of Kansas, he must also take the objections of the people of the state into account because "those objections should be seriously taken into consideration and the evacuees kept out of those areas, first because of the safety of the Japanese themselves and second because it would only create turmoil and discord in the communities." 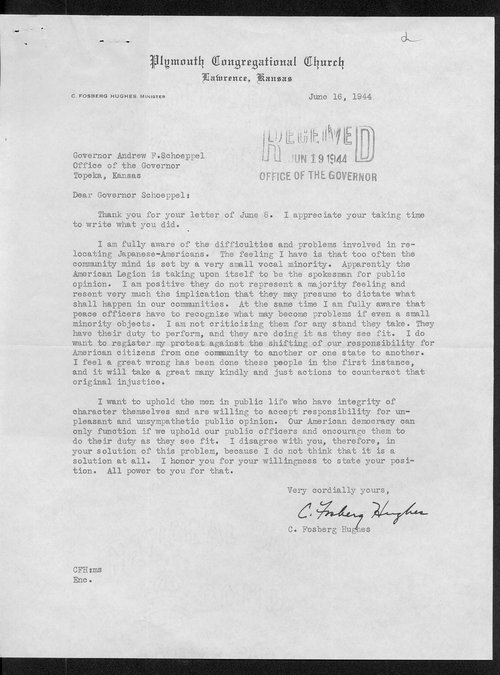 After reading Schoeppel's lengthy reply, Hughes responds by stating that he is aware of the argument against sending Japanese Americans to Kansas. However, he argues that "too often the community mind is set by a very small vocal minority." Therefore, Hughes asks Governor Schoeppel to do what he can to make sure that Kansan's do not shift their "responsibility for American citizens from one community to another or one state to another." This item can be used with other items on Japanese Americans to give students some insight into the difficulties they faced during World War II. Furthermore, this item highlights the difficult and tense race and ethnic relations of the period.